As the crisis of imperialism sharpens, the U.S. government is responding by lashing out harder against national liberation forces. This is particularly true for national liberation movements that are fighting for self-determination and against U.S. imperialist interests. 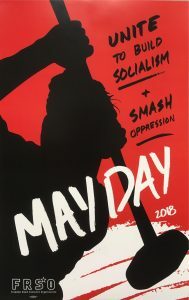 Freedom Road Socialist Organization stands in solidarity with all peoples fighting for national liberation—both within the U.S. and abroad. We demand the release of all political prisoners that are part of the movements demanding self-determination for their peoples. Former Black Panther Party member Mumia Abu-Jamal and American Indian Movement member Leonard Peltier are the best-known political prisoners in the U.S. They have been imprisoned for decades and we call for their immediate freedom. But they are not the only ones. We call for freedom for the many political prisoners and Prisoners of War in U.S. jails from the Puerto Rican, Black, Chicano, and Native American liberation movements. We demand freedom for the growing number of military resisters. We demand freedom for political activists who have been jailed for their progressive political activity. We also denounce the use of imprisonment and torture by the U.S. in its “war on terror” in the Middle East and South Asia. Guantanamo Bay and Abu Ghraib are atrocities of justice, which violate international law and trample on sovereignty. We denounce the United States’ use and justification of torture. These prisons are examples of how the U.S. is criminalizing national liberation movements, and we demand their immediate closure. The prisoners in U.S. prisons in Guantanamo Bay and in Iraq and Afghanistan have committed no crime. They have the right to resist U.S. imperialism. In Colombia, the U.S. has supported the right-wing government with military aid and advisors. The Colombian government uses U.S. assistance to criminalize, fight, and jail any resistance to their free trade, imperialist agenda. The recent U.S. trials of FARC-EP members, Ricardo Palmera (Simon Trinidad) and Anayibe Rojas Valderrama (Sonia), demonstrate the U.S. government’s use of their legal system as a new tool of imperialist aggression in Colombia. We denounce the illegal extradition, kidnapping, “kangaroo trials,” and punishment of these fighters. The U.S. has no right to prosecute them and they have committed no crimes. We stand in solidarity with all the peoples of Colombia who challenge U.S. imperialism—including the FARC-EP. The FRSO has been leading the work in solidarity with Ricardo Palmera’s trial and has exposed it for the sham it is. The FRSO stands in solidarity with the brave fighters for a free Palestine. We demand that the political prisoners are let free and that there is an end to the criminalization of all those fighting to end the apartheid system and occupation of all of historic Palestine. This is especially true for Ahmad Saadat, the General Secretary of the Popular Front for the Liberation of Palestine (PFLP), who was kidnapped from the Palestinian Authority’s Jericho prison by Israeli forces in March 2006. In addition to funding Israel’s apartheid regime that targets and jails Palestinian freedom fighters, the U.S. has played a direct role in jailing Saadat. While imprisoned in Jericho, U.S. and British soldiers provided security for the prison. In 2006 both British and U.S. soldiers left their posts to allow the Israeli military to lay siege to the prison and kidnap Saadat and his jailed comrades. We demand that Ahmed Saadat and all other political prisoners in Palestine are freed! Long live the resistance to U.S. imperialism! Freedom for all political prisoners now! The New Red Trend–“Left” in appearance, Rightist in reality– decide to boldly lie about the FRSO events as they happened, and the results. The FRSO moves forward with Districts in New York, Los Angeles, Chicago, and Minneapolis, plus members in six other places. The FRSO continues to publish in English and Spanish the activist newspaper Fight Back!/¡Lucha y Resiste! Thousands read it during work, at church, inside the corner store, on campus, and in the welfare lines. Celebrate International Workers’ Day 2015 with Struggle!